and perhaps new to the area? Have fun & chat in English at our events! in Franconian history and culture. Join us at one of our monthly meetings or other activities. Enjoy our friendly atmosphere in cordial surroundings, speak some English while making new acquaintances and simply have some fun at our events! We encourage interest in Franconian culture and history. We promote understanding between the German community and English-speaking residents and guests in Franconia. We try to help others through our long-standing charity work, at home and further afield. We offer a venue for shared experience, informed debate, social interchange, enjoyment and fun. 6:00p.m. 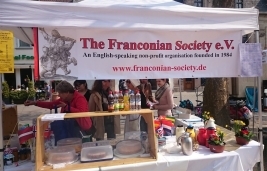 Franconian Society e.V. Annual General Meeting. for members only. To be held at the Turnerbund. 1:00p.m. to 6:00p.m. Erlanger Frühling, Neustädter Kirchenplatz. Look for our Information Stand, where we will be offering coffee and cake, as well as a display from our Handicrafts Group, to raise money for charity. If you would like more information or would like to help us out, please see the attachment. 9:30 a.m. Happy Hiking Boots. Meeting point: Turnerbund 1888 e.V., Spardorfer Str., Erlangen where we will meet to form car pools to see the Easter Wells. More information here . Please contact Christoph Helwig to register. You may also telephone him - see the attachment for the number. 6:30p.m. Stammtisch at the Turnerbund. 8:15p.m. "How to be a traveller and not a tourist in Australia" with Mairi Barkei. If you have any questions, please contact us. Send us your email and we'll tell you more! Your email address is on it's way!